Robbie Evans was among an estimated 18,000 Wrexham fans at Wembley for the north Wales club's 2013 FA Trophy win over Grimsby Town. Wrexham beat their Conference rivals on penalties on a cold March day to become the first Welsh club to win English non-league football's biggest prize. Evans will be back at Wembley for Wrexham's FA Trophy final against North Ferriby United on 29 March. But this time Evans will be travelling to north London as a member of the first team squad rather than a supporter. "It's just mad how it's happened," says the 19-year-old midfielder. "Two years ago I went there as a youth team player and now two years on I'm going as a professional player. "I loved going down as a fan but I think I'll love it a little bit extra going as a player this time." Evans was one of the fans who defied heavy snow around the town to travel for the club's first ever appearance at Wembley two years ago. Snowfall of 10-20cm had made travel arrangements difficult for some supporters and Evans himself had to dig deep so he could leave his home in the village of Penycae. "I was a youth team player at the time and we had to meet up at the training ground to start off at eight o clock in the morning," Evans added. "It took me and my dad two days to get the car out of the drive and managed to get to the training ground in the end and then on the bus with the youth team. "We stopped off at one of the services and I think every coach that went down stopped off at the services so there were about 5,000 Wrexham fans there. "It was nerve-wracking but grateful that we won the game in the end." Wrexham needed penalties to beat Grimsby in 2013 after the game had finished 1-1 at the end of extra time. 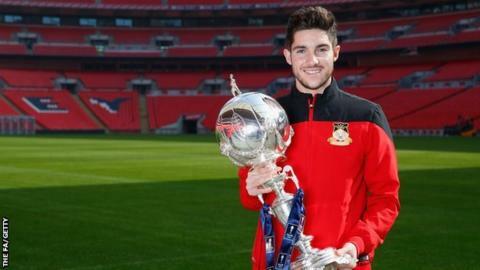 Sunday's final against Conference North side North Ferriby will be Wrexham's third visit to Wembley after two trips in 2013 for the FA Trophy final and Conference play-off final, which they lost to Newport. Their latest trip to the home of English football comes during the season they have been marking their 150th anniversary. "It's panned out perfectly for the club," Evans added. "You couldn't write a better 150th anniversary. "It's going to be an incredible day and hopefully we can get that trophy for the fans. "North Ferriby are going to be in the same boat as us, they want to win the game. "Yes, they play in a league below us but I don't think there's that much difference. We can't underestimate them. We've got to be professional about it." The Wales Under-19 international signed his first professional contract in 2013 and has become a firm favourite with the Racecourse fans who laud him as "one of their own." He has scored twice in 19 appearances this season and hopes to be in the side that will face North Ferriby. "I'm desperate to get on that team. To be on the pitch would be incredible," Evans said. "It means so much to me because I'm a local and my family and friends are all Wrexham supporters."